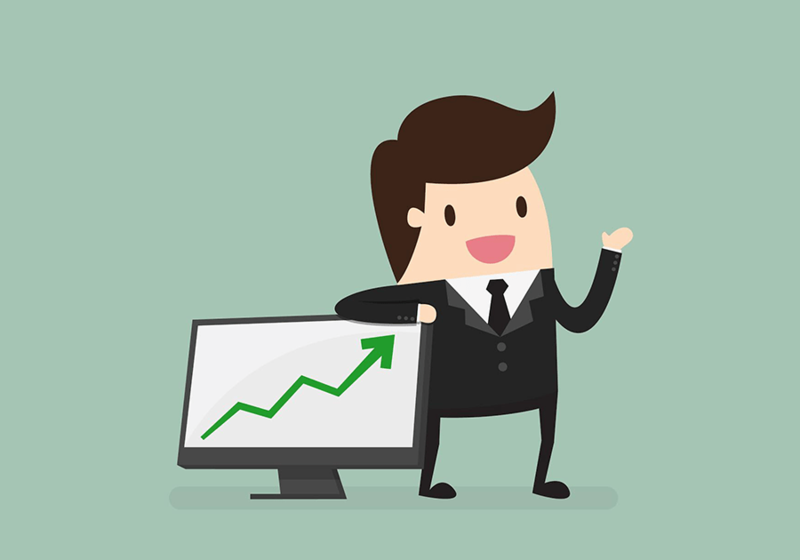 Everyone wants to increase conversion rate on their website to achieve more sales and get bigger profits. To make this dream come true, you can start with simple little improvements. Think of the product pages you have in your dropshipping store: are they appealing enough? Can they motivate the store visitor to make a purchase? Maybe you can improve some of the features? 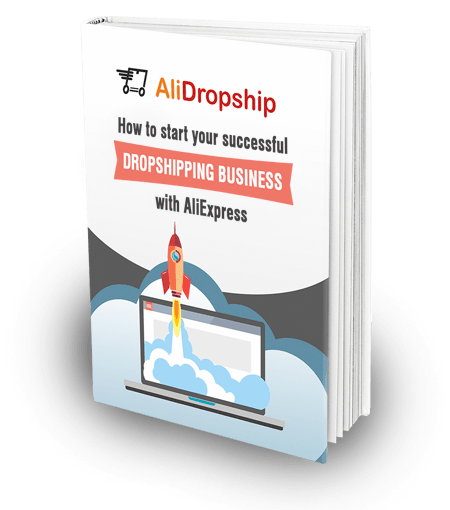 If you want to increase conversion rate dramatically and achieve a highly successful performance of your dropshipping store, you can take a number of quite easy steps that will definitely make a difference. 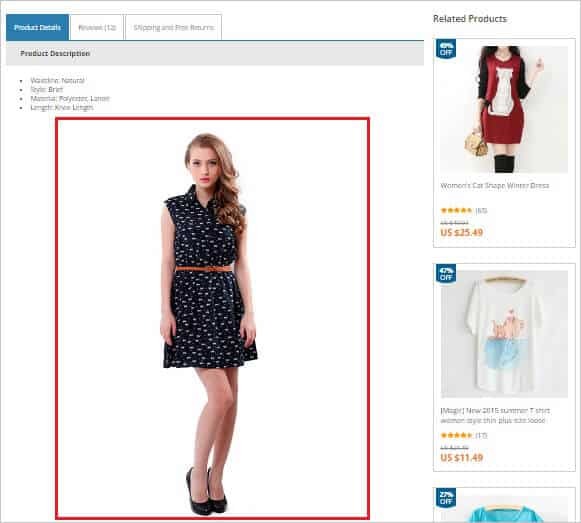 This article is devoted to one of such steps: modifying descriptions of products you have imported from AliExpress and creating appealing product pages that will lure store visitors into making a purchase. Funnily enough, AliExpress products are known worldwide for their bizarre titles. 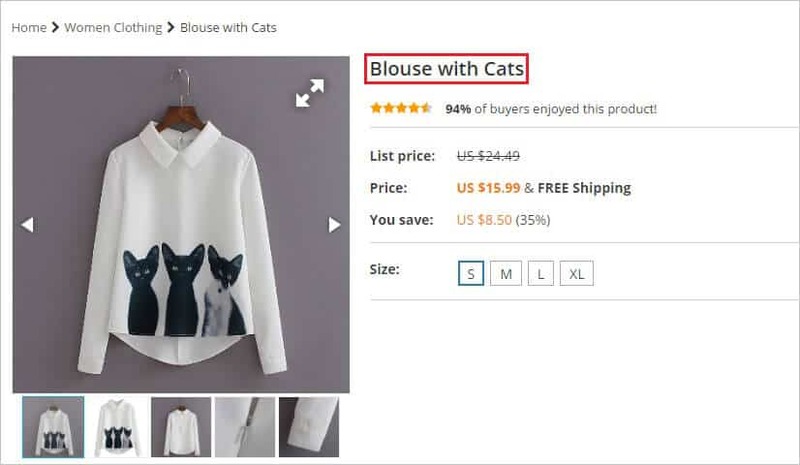 It is explained by the fact that AliExpress has an integrated system that automatically translates product titles into the chosen regional language. Even though it is an eternal source of fun, it is not quite good for the product reputation and overall customer trust in the store. To make the imported product look more reliable and trustworthy, and to make it easier for customers to search for the necessary products, it is recommended to edit the titles manually. Try to use not more than 3-5 words – the longer titles are not read anyway. The title, as well as the product description, should contain keywords that make SEO way easier. In case you offer your customers a wide range of really similar products (for example, t-shirts), try to include their distinctive features into the titles. For example, ‘Green T-Shirt’, ‘Cotton T-Shirt’, ‘Cat Print T-Shirt’ etc. will instantly let a customer know how do these products differ. It is also often recommended to capitalize titles. When you import items from AliExpress, the permalinks get transferred to your webstore as well. They are identical to the title, so after you change product title, make sure the link has also changed as well. All you need to do is delete the old permalink and press ‘OK’ button – the new permalink identical to the amended title will be generated automatically. To create an engaging product page and improve conversion rate, you first of all need to pay close attention to the text formatting. Neat text structure with clear paragraphs and readable font makes it easy for webstore visitors to read the text and carefully consider the item specifications. It’s not a secret that a text that is difficult to read is just as difficult to comprehend, and in case they can’t properly understand the page contents, clients are likely to simply leave this page without making a purchase. Taking this factor into consideration, it is also important to mind the way the product description is written. Try to avoid long complicated words and grammatically confusing sentences. Since you are targeting a broad customer audience, it is vital to make this product description accessible to everyone. The rules of writing product description may partially vary depending on the category you are working with. Surely enough, all the categories have their specific features that need to be highlighted in the description. Still, there is a set of basic principles that should always be taken into consideration. First of all, make sure that this description is valuable for your potential customer. Your goal is not to bluntly advertise the item saying that it is awesome, great, and irreplaceable. Your goal is to list and explain all the item features: the material it is made of, its size dimensions, technical parameters (if any), directions for use, maintenance instructions, etc. Imagine you are selling this item in a regular store, and a customer comes to learn all the additional details. You need to cover all the aspects that can prompt customers’ questions in order not to let anything prevent clients from making a purchase. Encourage your potential clients to ask questions – let them know they can always contact you for help and advice. If this item comes in various sizes (it is especially important for clothes, jewelry rings, etc. 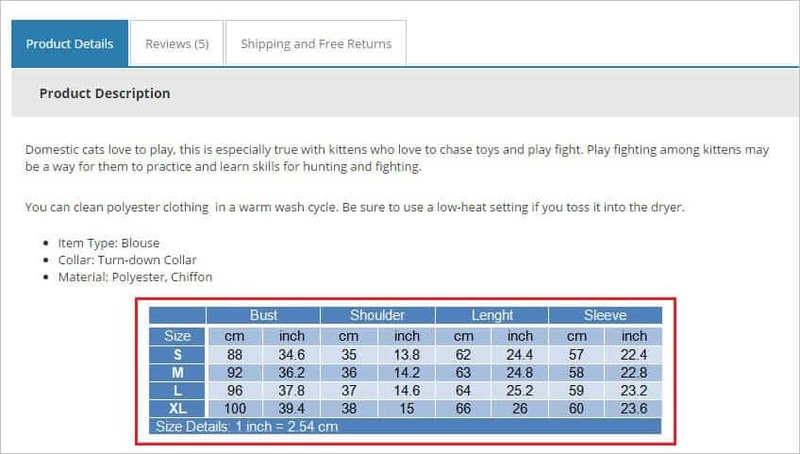 ), make sure you have included a size chart into the product description. Let your customers know that it is more accurate to look at their own measurements than on standard size marking. These markings can actually differ for various regions – for example, Chinese XL shirt and US XL shirt will not be identical in size. Therefore, the size chart you post on the product page should include measurements taken in various metric systems (US system, international system, etc.) –it’s not always easy for customers to correctly evaluate an item size in centimeters when they are used to inches, etc. For customers’ convenience, it is recommended to also post pictures showing how to take these measurements. It would be the best to put these tables and pictures on the first place in the product description since customers don’t always read through the whole description. Since we’ve started talking about size chart pictures, it is necessary to cover such an important issue as the quality of visual materials to increase conversion rate in ecommerce. Make sure the photos you’ve taken from the suppliers have a high resolution and create a good overall impression. Try to avoid importing pictures that are obviously photoshopped since they don’t look credible enough. Also, be watchful of watermarks – as a rule, they are not taken positively. If you need to edit the pictures slightly (cut, rotate, flip, add brightness or contrast, etc. ), you don’t have to use professional graphic redactors like Photoshop. If you don’t have the experience, just use some simpler services like XnView that are really easy to manage. 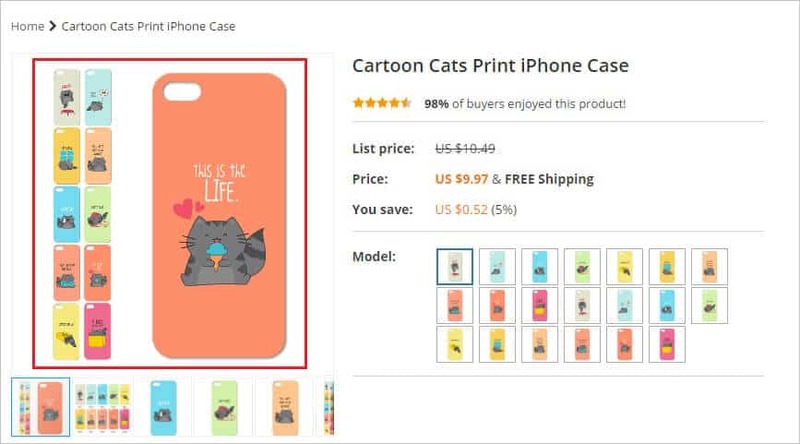 Speaking of the photos’ content, it is necessary to mention that customers generally look for pictures showing the item in use. Try to pick the photos demonstrating the product in real life as it allows getting an overall impression about the real color, size, material, texture, etc. These pictures should be diverse – several look-alike photos taken from the same angle don’t provide clients with much information. It is a good idea to include some close up photos showing tiny details. Try to post not more than 3-4 photos , otherwise it will be tiring for customers to look through them all. It is also a good idea to create a collage that includes several good quality pictures. It is exceptionally useful if this particular item has lots of product variations – pick the most popular of them, combine them into a collage, and post it both in the photo gallery and the item description. There is plenty of online services allowing you to create such collages quickly and easily. You can also include a video in the product description. This is especially useful for products that have some interactive features: light and sound effects, automatic movements, etc. Therefore, such videos let customers know how exactly this item works and functions. Product rating is an important parameter that heavily influences a customer’s decision to make a purchase. It is an average score that shows how highly did previous buyers evaluate their purchases. Using product rating you will definitely improve convertion rate of each single page of your online store. We would recommend importing items that have a rating more than 4,5 stars. Ideally, you should go for products with 4,7-4,9 starts rating. Surely enough, the number of orders has a direct influence on the level of customers’ trust towards the item and the whole store. At the same time, this parameter is exceptionally important for store owners themselves as it gives them the opportunity to trace and define the most popular products within separate categories. A newly created store obviously can’t have a huge amount of orders. If you import your products from a well-reputed AliExpress supplier who sees an exceptional demand, make sure the number of orders is plausible enough. Remember that you can change it manually to make it look more convincing, and don’t set it too high. Customer reviews are an essential part of any product page since they give customers an insight into the real item features. This is why it is highly recommended to import these reviews from the product page on AliExpress. Still, look at them carefully: it is preferable to add reviews that have real photos from customers showing the item in use. Mind the language as well: since our plugin automatically translates the reviews to the language you’ve set as a primary for your store, some inaccuracies may appear. As you know, the plugin allows automatic price correction on the basis of a formula you’ve chosen. Nevertheless, you can easily amend this new price and set a new one manually if you feel like it will better match the item quality and popularity. 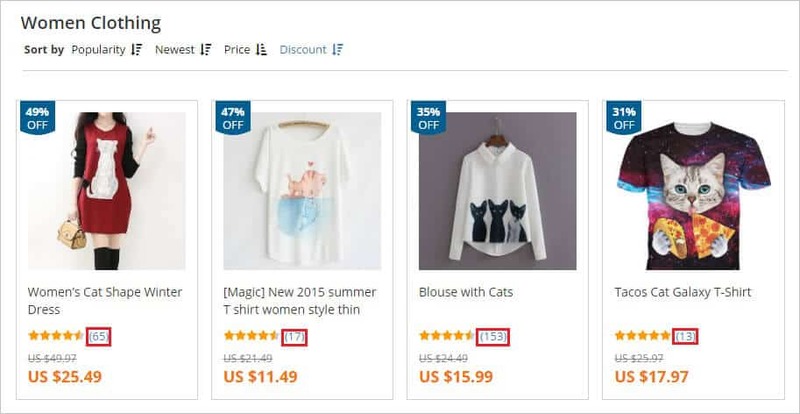 It is quite common for AliExpress to give you 1-3% discount for importing their items to your store. It is not recommended to show it to customers since such a tiny discount doesn’t look credible. If you want to launch a sale, set a discount of at least 20%. All these simple actions will definitely help you increase conversion rate in your drop shipping store.Why not give them a try? Thank you! This Article has Helped me a lot. Its written in a clear and understandable Style! A doubt: what is “capitalize titles”? 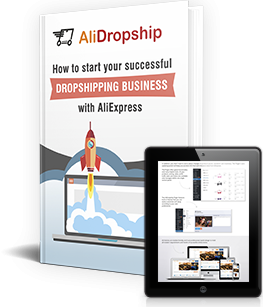 My Dropship store is built by Alidropship so I think that most of the aforementioned tips are covered, please confirm this to me except what I’m supposed to do on the product description. If you have ordered AliDropship custom store, all these requirements, indeed, have been covered by our team. All the products that were added to your store by our specialists were optimised according to these tips. So, you will only need to follow these recommendations when you add new products to your store by your own effort.